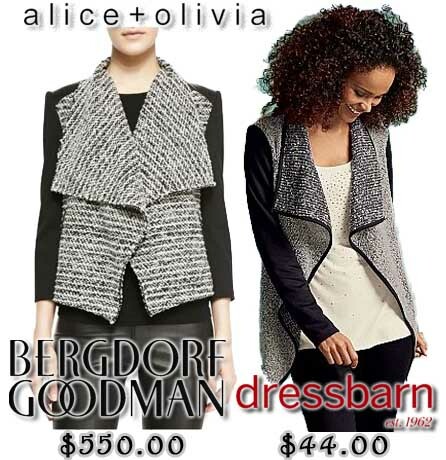 Luxury Look-Alikes For Less: A Fall-Ready Textured Jacket, Featuring Alice + Olivia Vs. Dress Barn! Since my closet space is already limited & bursting, I only have a few must-haves on my fall wardrobe shopping list. However, when it comes to textured jackets, it kind of becomes an impulse buy only because I have a historical love affair with cardigans. But one such jacket has left an impression on me & I had to have it, which only made me happier for my choice upon the discovery that it was already a luxury brand imitation at a much more affordable price. At Bergdorf Goodman, one can acquire the Alice + Olivia by Stacey Bendet Burma tweed jacket ($550.00) to don the original design, which is a very beautiful combination of menswear inspiration & the sort of modern interest that affords staple everyday separates. My latest addition was the shawl collared jacket ($44.00) from Dress Barn, which I was happy to buy in one size smaller for a sleeker fit on my arms, without having to break the bank either. Also, for shoppers looking to save a little extra, use code jkt25 for an additional 25% off when ordered online. One thing that I love about shopping with Dress Barn is that there’s free shipping anytime your online order is shipped to a store location. Now, I recognize that these aren’t identical designs, but the mixture of a heavy fabric that wears lightly is the main appeal, along with the endless styling possibilities for both day & the office, transitioning perfectly for happy hour cocktails. I choose the H&M crepe dress ($29.95) in black, accessorized with the Sonya dress bootine ($34.99) in black from Payless & Francesca’s Bailey coil belt ($9.99). For a chic day out, pair the jacket with basics like the collared surplice blouse ($17.80) from Forever 21, leggings ($24.90) in black from Gap (available in XS – XXL), & the round flat over-the-knee boots ($40.99) in black from Charlotte Russe. How would you style this jacket? What textures are you most drawn to for the upcoming cooler season? What fall trends are you shopping for? For more stylish posts, be sure to check out the latest runway show from Diane von Furstenberg, Warby Parker’s new fall eyewear collection, the fashionable international magazine covers for September! Happy Styling! This entry was posted in Basics for a Bargain, Inside A Style Blogger's Closet, Luxury Look-Alikes For Less, Quickie Darling Deal & Steal, Splurge or Save?, Style Darling Daily and tagged affordable fashion, Alice + Olivia by Stacey Bendet, Basics for a Bargain, Bergdorf Goodman, Charlotte Russe, collared shawl jacket, Dress Barn, fall fashion, fashion, Forever 21, Francesca's, Gap, H&M, Inside A Style Blogger's Closet, Luxury Look-Alikes for Less, menswear inspiration, Payless, Quickie Darling Deal & Steal, Splurge or Save?, style, style for days, textured jacket. Bookmark the permalink. ← Runway Rundown: Monique Lhuillier’s Complete Spring Summer Ready-To-Wear 2015 Collection From New York Fashion Week!